Strive to understand your and other people’s perceptions if you wish to learn how to control your state of mind and enhance your communication. Don't forget that your and your prospect's map of the reality is not the same – the meaning of the same thing is different for different people. The first Neuro-linguistic perceptual position “Self” is a total self-reference, and operates from the self or from ones own eyes. Explore what you think about the relationship. Label both your own and the other person's behavior. Change the state – shake off all bad feelings. The second perceptual position “Other” enhances your ability to empathize. It gives you the ability to see another person’s logic especially when you are in an argument. You can also get some insight into your behavioral characteristics, and what someone else thinks about you. It is also an important model for strengthening rapport. Explore the relationship from the other person's point of view. Imagine how they experience your behavior. What sort of label would they put on it? How do they feel? Shake off that emotional state before continuing. 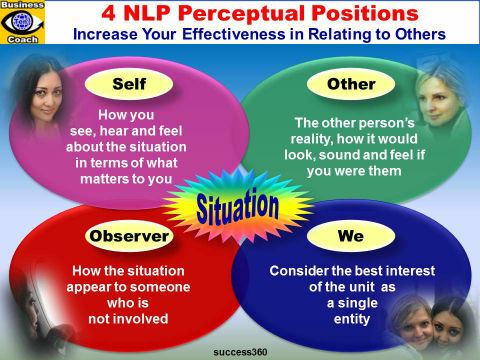 The third Neuro-linguistic perceptual position “Observer” is a complete dissociation from the entire conversation or experience. Go outside the relationship, become a detached observer – imagine a stage and see both of you on stage. See that other person doing what they do, and see yourself responding to them.Shift your question from 'How can I change that person's behavior?' to 'How am I reinforcing or triggering that person's behavior?' Explore how else you could respond to him or her. The fourth perceptual position, defined as a “We”, is the viewpoint from the perspective of the system as a whole. In order to take the fourth perceptual position, step aside and take on the perspective of the whole arrangement by considering the best interest of the unit as a single entity. Associate yourself with the whole system. Here your aim is to contribute to this single unit, by considering “our” common goals.